Located on the first floor, this beautiful room is popular for cocktail parties and congenial luncheons and dinners. 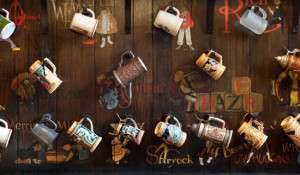 It is lined with hundreds of remarkable beer steins and amusing caricatures of Club members painted on the exquisite dark wood paneling. 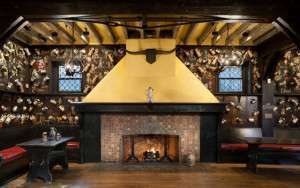 The bar, fireplace, baby grand piano, and antler chandeliers complete the warm and inviting room. The Grille Room can accommodate 75-100 people for a cocktail party or 40 people for a seated luncheon or dinner. Located on the second floor, this magnificent theater is admirably suited for receptions, business meetings, dining and dancing, as well as theatrical productions. An elevator to the second floor is available for those who require assistance. 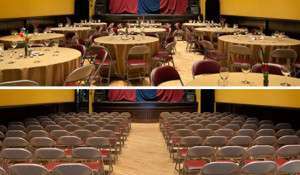 The Ned Rogers Theater can accommodate 150-200 people for a cocktail party, 120 people for a seated luncheon or dinner, or 200 people for theater style seating. The Mask and Wig Club maintains a catering club liquor license and we are pleased to provide beverage service on either an open bar or cash bar basis. Mask and Wig will provide the bartender service. Prices start at $1,250. Specific costs provided upon request. For more information or to schedule a site visit, please contact our Club Manager, Kate Rice at [email protected], request a Clubhouse rental, or call (215) 716-7378. Take a virtual tour of our Clubhouse with this YouTube video, or see 360° panoramic views of our Grille Room and the Ned Rogers theater with our photospheres. To send us an email, click here to visit our contact form. If you want to rent the Clubhouse, request a rental here. If you want to book us, visit our booking request form. Located in Center City Philadelphia. Click here to find out more about our facility and Clubhouse Rentals. See new content, get in touch, and keep track of our productions at our Facebook page. Regular content includes video sketches, show updates, and band performances. Find us at The Mask and Wig Club on Facebook.